Axe Gang Advisor: Lets kill them all and make this place a brothel! Axe Gang Advisor: So that makes you the best killers in circulation, right? Harpist #1: In actuality, we are just a pair of street musicians. Barber: Why don't you train us to be top fighters... and we'll avenge them! 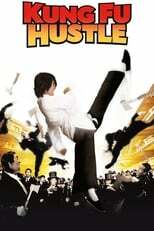 Landlady: Becoming a top fighter takes time, unless you're a natural-born kung-fu genius, and they're 1 in a million. Barber: [Doing martial arts routine] It's obvious I'm the one! Landlady: [Punches him in the face, knocking him to the floor] Don't think so. Bone: Memories can be painful. To forget may be a blessing! Sing: [amazed] I never knew you were so deep. Bone: You gave him your life savings? Sing: Yes. I was saving to become a doctor or lawyer... but this was world peace. Brother Sum: Ever killed anyone? Sing: I've always thought about it. Donut: [in English] What are you prepared to do? Landlord: We can't understand what you're saying! Sing: [feelingly] I realized then that good guys never win. I want to be bad. I want to be a ruthless killer! Bone: [looks up] Ice cream! The Beast: What awesome kung fu was that? Sing: You wanna learn? I will teach you! Don't get me wrong! I only want to kill you, or be killed by you. How come you became righteous? Have you anything to say? [Sing draws a stick of candy on the ground with his blood] I can't read it, it's not in Chinese! In the world of kung fu, speed defines the winner. You may know kung fu... but you're still a fairy.